Without the detailed insider info from Neil and Harriet, I'd never have had the confidence to set off through the beautiful and remote Andean backroads. Inspirational routes over some of the best cycle touring terrain in the world, and authored by real experts. Highly recommended. guide to a region north-west of Lima that's often neglected by Brits in favour of the Inca Trail, but it has some of the world's finest trekking and mountain biking. 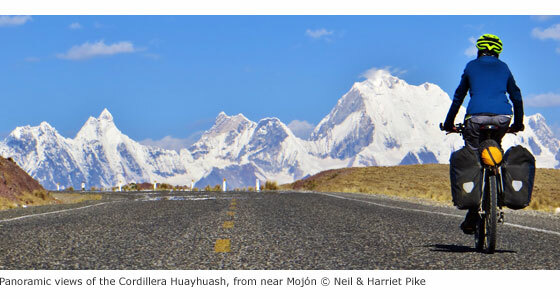 The Cordilleras Blanca and Huayhuash boast some of the most spectacular scenery in the Andes, and some of the most accessible high altitude trekking and cycling in the world. Perfect pyramidal peaks, gargantuan ice falls and turquoise alpine lakes are all easily reached from Huaraz, the region's capital and centre of tourist comforts. This practical guide contains 50 detailed route maps and descriptions covering 20 hiking trails and 30 days of paved and dirt road cycle touring. Trekking – the classic treks: Huayhuash Circuit, Santa Cruz and Alpamayo Basecamp, as well as lesser known, wild walks in valleys which see few visitors. Ranging from easy day hikes to challenging routes of 10 days or more, all can be trekked independently or in guided groups. Cycling – includes the Huascarán Circuit, a loop of Peru's highest mountain, as well as four other multi-day rides and five day-cycles from Huaraz. Covers all the information cyclists need to pedal past glaciers on 6000m peaks or fly down 2500m descents from high passes. Mountain biking – includes two detailed downhill routes and information on organising guides to lead you through the labyrinth of exciting singletrack in the area. Based around the regional capital of Huaraz in northern Peru, the Cordilleras Blanca and Huayhuash are an Andean adventure paradise. Covers three of the area's main adventure attractions – trekking, cycle-touring and mountain biking. This practical guide contains 50 detailed route maps (hand drawn in the classic Trailblazer style) and descriptions covering 20 hiking trails, 30 days of paved and dirt road cycle touring, and information about mountain biking in the area. The authors blog at pikesonbikes.com and can be followed on Twitter (@pikesonbikes) and Facebook (Pikes on Bikes).